What Does Ethics Mean To IT Workers? I don’t know about you, but my eyes start to roll up into my head anytime I see an article with the word “ethics” in its title or if a speaker makes the mistake of saying “… let’s talk about ethics…”. Yeah, yeah I know that this is the wrong attitude and that if I’m not careful I’ll end up getting myself in trouble. Or will I? I mean, I think that I’m smart enough to make the right decisions if push came to shove – aren’t you? Kieran Mathieson over at Oakland University has spent some time thinking about this issue and he thinks that we are all in trouble. There are really two parts to this discussion: how did we get here and why is ethics so hard for mere mortals to deal with? Dr. Mathieson points out in an article in the IEEE’s Computer magazine that us in the IT field basically see things in black & white: programs work or they don’t. We might argue about if Java is better than Ruby, but issues like this don’t affect our core beliefs. However, ethics is a different issue. Ethics sneaks its way into everything that we do: choose a mate, raise children, do work, spend money, and vote. 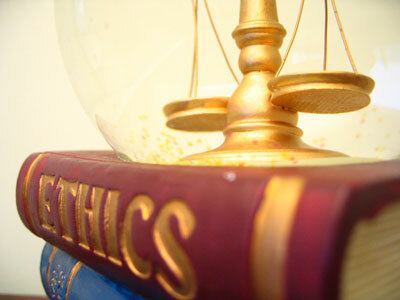 One of the big differences between the the world of IT and the world of ethics is that ethics doesn’t come with any rules – just what is the “correct” ethical decision in a given situation? Would you have the guts to talk about ethics with your IT team? Yes, I know that the correct answer is a quick “Yes”, but come on, would you really? I mean ethics questions have the ability to divide your team right down the middle. Oh, and if you’ve got a multicultural team, give it up – nobody will see a given ethical situation the same way. So I swing back to my original point – ethics is quite boring until it’s not. The reason that so many IT folks (Enron, Worldcom, HealthSouth, etc.) find themselves on the wrong side of ethical decisions has a lot to do with how ethical situations show up. Unfortunately they don’t appear before us as someone handing us a gun and telling us to go shoot someone (with big flashing lights going off and scirens sounding). Nope, they sneak in around the edges of our lives. How about this: your boss doesn’t approve some meal that you had while traveling and so you end up paying for it. Feeling angry, you pad your next 5 expense reports in order to “get back what you are owed.” But then things are just a bit tight at home, and so you keep padding your expense reports in more and more creative ways even after the original imagned offence has been repaid. Later on, you are picking vendors for some small thing, let’s say to supply paper for your printers. One of the vendors being considered takes you aside and says that if you select him, he’ll provide you with a 10% discount off of his quoted price in cash once a month. He has a fairly good price and you might have selected him anyway. You are really only talking about a small amount of money, and you sure could use it right now with your bills starting to pile up. You look him in the eye and say “ok, but I would have selected you anyway” and somehow you feel better. You feel even better when the cash starts showing up in an envelope mailed to your house each month. And so it goes… Can you see how a small ethical decision can open the door to much larger ethical violations? An avalanche starts very small, but in the end it can do a lot of damage. So what’s an IT person to do? Simple, practice, practice, practice. Everyday we have opportunties to make coutnless ethical decisions (remember how it sneeks into all facits of our lives?). Recognizing that a decision is an ethical decision, no matter how small it seems to be, will help us to practice our decision making. Once we get onto the right ethical path for us, practice will help us to remain there. Have you ever found yourself having to make a difficult ethical decision at work? How did you get into this situation – did other decisions lead you to this point? How did you decide what to do? What were the results of your decision? Leave me a comment and let me know what you are thinking. What Is The #1 IT Skill That A CIO Needs To Have?